I was determined to make a healthier version. 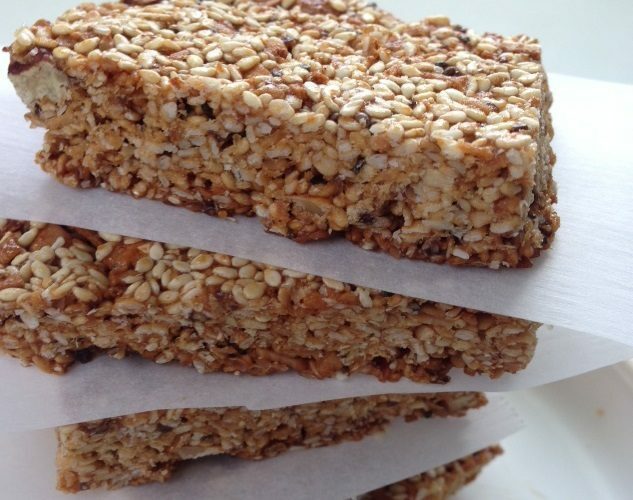 But I was disappointed to see that most of the recipes out there on the Internet for homemade sesame snaps or sesame bars use quite a lot of sugar or sweeteners as the main ingredient as well. I really wanted a healthier, lower sugar version. So when I stumbled across this recipe (see source) from bon appetit for Sesame-Peanut Bars Recipe by Molly Mitchell, I was ecstatic!! I tried it out right away, making some modifications and a winner was born. I absolutely love the fact that it only calls for ¼ cup of honey. This is a very easy and versatile recipe, and quick to throw together when the snack craving hits. Use whatever you have in the kitchen, be it toasted or raw sesame seeds, sweetened or unsweetened coconut flakes or coconut shreds. I’m sure it will work fine with other nuts too such as chopped pecans, hazelnuts or walnuts. Feel free to experiment. You can also make these bars a few days ahead of time and store them in an airtight jar or container. However, if you don’t intend to eat all of this right away, the best method I’ve found to maintain the crispiness of the sesame-cashew snaps is to freeze them in an airtight container. Then take some snaps out to thaw for about 10 minutes before consuming. The problem? Now I’m also addicted! A healthier and highly addictive protein-packed nutritious vegan, dairy-free, egg-free, gluten-free and oil-free snack for all ages. Make a big batch and freeze the extras! Preheat oven to 350 F (180 C). Line a 9 inch x 13 inch glass baking pan with parchment paper, with sufficient overhang on all sides. In a large bowl, mix the dry ingredients (sesame seeds, coconut, chopped cashew nuts, salt and optional ingredients like the flaxseed meal and chia seeds if desired). Add the wet ingredients mixture to the dry sesame seed mixture and mix well. Scrape mixture into the prepared baking dish, and then press firmly into an even layer, as thinly as you can! Bake in the oven until golden brown around the edges (at least 20–25 minutes, depending on how thick the mixture layer is). Remove the pan from the oven and let cool for 10 minutes. Then lift the entire parchment piece with the baked layer out of the baking pan (if it starts to crumble, let cool longer) and let the cashew-sesame snap block cool fully on the parchment paper on a wire rack (this cooling process will take at least 30–40 minutes). Once the cashew-sesame snap block has fully and completely cooled, cut into rectangular snaps. If you don't have any sunflower seed butter on hand, feel free to use another nut or seed butter instead. The result will be just as delicious and crunchy! If you would like to try and make your own sunflower seed butter, see the recipe here. (Source: Sesame-Peanut Bars. Bon Appétit. http://www.bonappetit.com. ← What is in Rhubarb?